Welcome to our collection of walks and hikes in and around the Fethiye area. A mini Fethiye walking guide made up of the Fethiye walks we’ve written about over the years. Not all of us are intrepid explorers, itching to get off up into the mountains around Fethiye kitted out with our hiking boots and our lightweight trekking poles; we know that! 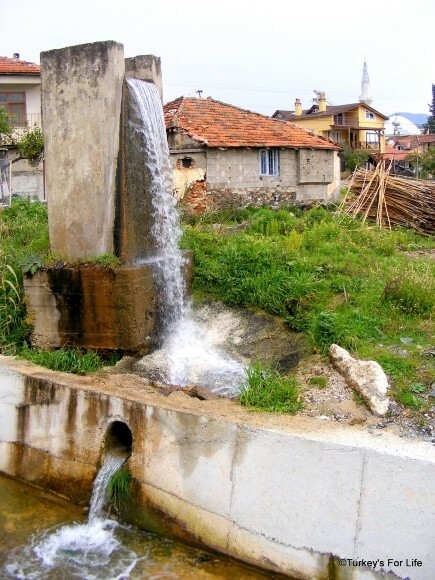 This page is a collection of Fethiye walks that suit many. Whenever we write about a walk on the blog, we’ll add it to this list. Some of our walks in Fethiye are but a gentle stroll, taking in the scenery. Some of them are lengthy but not too strenuous. Other hikes are moderate – they might have hilly parts but the walk itself is quite short. We’re also including gamboling around and between ancient ruins. And then we’ve got the more strenuous ones that take you off into the them there mountains. Something for everyone who likes a wander. In our list of what not to miss when you’re in Fethiye, we say we would like to include more treks in the list but the assumption is that most people are visiting in the summer months. Well, the world famous Lycian Way route starts here so, of course, that’s a ‘not to miss.’ So, if you’re here when the weather in Fethiye is a tad more agreeable for a bit of cardiovascular activity and you want to see the area from a whole different viewpoint, get your comfy shoes or boots on and do some hiking in Fethiye! Here’s what we’ve got so far. To view the walk, just click on the first link in each route and you’re off – right after reading the safety tips at the bottom of this page, that is! The walk around Fethiye peninsula is an 8 mile circular walk along the road that you can either do clockwise or anticlockwise. Lots of ups and downs. A good leg stretch with beautiful views. If you do this in summer, take a hat as it’s quite exposed. The plus point is bays such as Kuleli will be open so you can stop for a swim, drink or food. Out of season, the road is much quieter so you can take your own drinks and snacks. Our own made up name for this gentle horseshoe walk along Aşıklar Tepesi. A bit of a pull up the hill at first but lovely views over the whole bay and food and refreshments available at El Camino pub and a couple of other places. 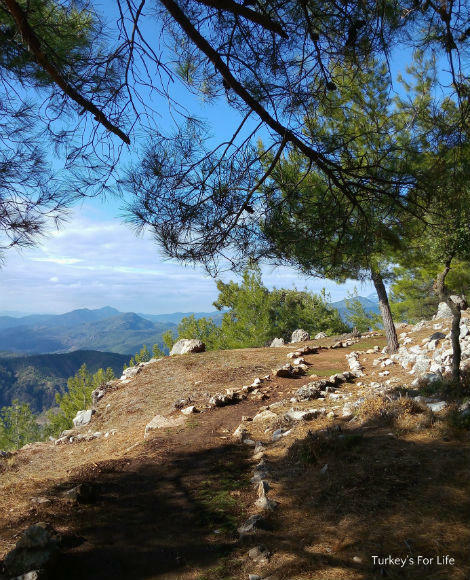 You can make this walk longer by taking a detour to the Amyntas Lycian rock tombs first. Some Fethiye walks are beach walks. This is walk along Çalış Beach heads straight for the hill you can see that separates Koca Çalış from Karataş Beach. A short clamber up the hill in Koca Çalış gives great views along the beaches and towards Fethiye. Yes, this one is definitely not part of the ‘hiking in Fethiye’ section. This is a gentle stroll along the flat following the route along Çalış Beach, through Koca Çalış and onwards to Çiftlik. And why do you want to go there? Well there’s the Thursday Çiftlik market for starters. Ahh, another of our favourite walks in Fethiye. Up and over the hill. A good leg stretch between Fethiye and Kayaköy. Take your own refreshments or grab a quick snack at Bülent’in Yeri or barbecue at Cin Bal when you get there. 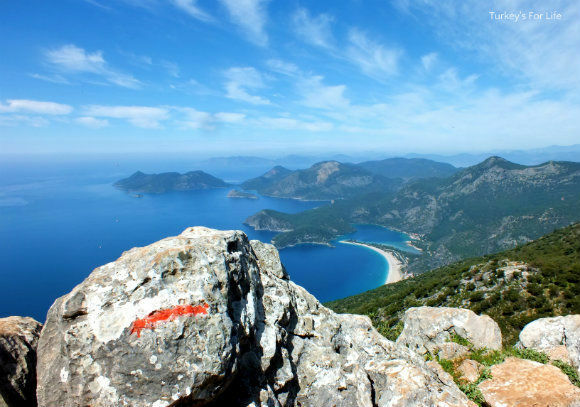 Or, you can join this walk up and continue from Kayaköy to Ölüdeniz (see below) or up to Ovacık. Truly stunning views and one of our favourite walks in Fethiye. Consult your wits before clambering into this ancient monastery carved out of the rocks. Either do a short hike to Afkule from Kayaköy or make it a longer hike by tagging it on to the walk between Fethiye and Kayaköy. A toughie – but well worth it. First, the hike from Kayaköy to Ölüdeniz is a clamber through the ruins of Kayaköy, then it’s the forested mountainside with amazing views over Coldwater Springs (Soğuk Su) and then the lagoon at Ölüdeniz. Short but steep so sturdy shoes are necessary for this hike over the hill to peaceful Cold Water Bay (Soğuksu Koyu) from Kayaköy. Here’s your hiking route to Cold Water Bay. This is the most strenuous walk that we’ve got on this page at the moment. Amazing views when you hike along the Lycian Way from Ovacık to Faralya and worth the effort. We’re including this one in our hiking in Fethiye page because, although Cadianda is a historic site to visit, it’s set high up in the mountains and it’s a good walk around the ruins. Best explored in sturdy footwear or trainers. Not in Fethiye but a walk near Fethiye. This walk between the ancient ruins of Letoon and Xanthos is a great little 5km stroll from Kumluova to Kınık and you can feel pleased with yourself that you’ve done a tiny section of the Lycian Way route. Obviously, you can take in the ruins of Letoon first and then visit Xanthos, later. Both of these sites are UNESCO World Heritage listed. Put simply, you must take responsibility for your own safety when you are out walking – and we’re talking roads and paths here, as well as hillsides and mountains. This walking safety page from the Ramblers Association in the UK is comprehensive and much of it can be applied to these walks around Fethiye. Give it a read as it covers safety from gentle strolls to serious mountain hikes. Very detailed walking maps akin to the Ordnance Survey maps you can buy in the UK are not available in Turkey. 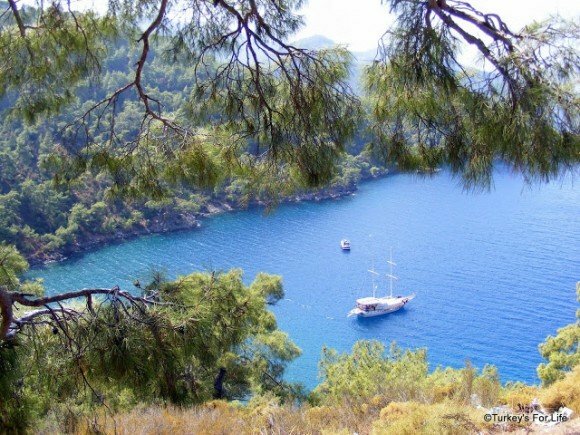 Most of the walks around Fethiye in our list above are easy to follow roads or forest tracks. 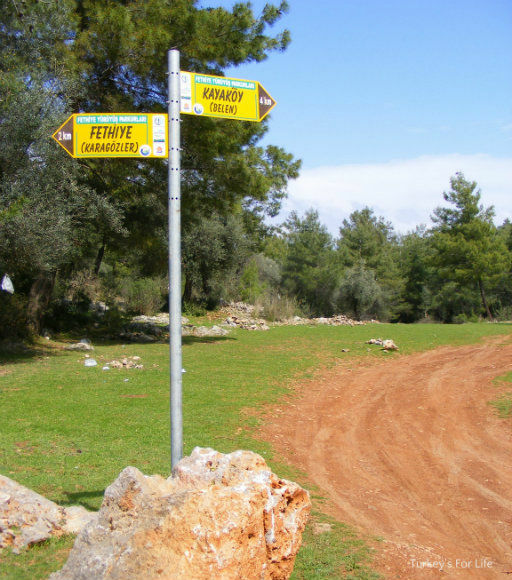 Some routes have the yellow ‘Fethiye Walks’ signposts. These are very occasional. For the more remote walks in hills and forests, always stick to the painted way markers on trees and rocks. These can be painted spots or stripes, depending on the walk. 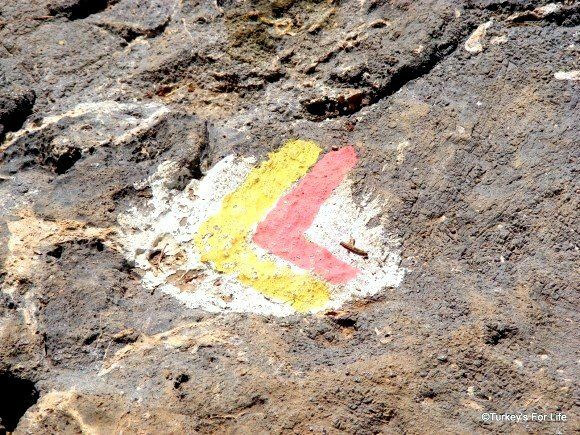 Any routes on the Lycian Way use the international red and white stripe way markers. As with hiking camaraderie in the UK – and no doubt elsewhere – helpful walkers have also started to build cairns and paint extra spots and stripes in areas where the path becomes difficult to follow. If you aren’t familiar with the international stripe system, two strips in a straight line means ‘continue straight on.’ When you see a chevron, like the one above, it is telling you to make a turn to the left or right. This one in the photo is indicating a right turn (imagine the stripe is your path and follow it from the bottom up). It is not an arrow pointing straight ahead. It’s not summer all year round in Fethiye. You need your proper winter walking gear in winter months. Even at sea level, out of the sun, it can be very cold! Higher up, temperatures easily plunge way below zero. Make sure you know sunset times – we don’t get those long summer daylight hours that occur in the UK – and give yourself enough daylight hours to tackle longer walks. Well, that’s the whole reason for setting off to do walks around Fethiye, isn’t it? Make sure you’re fully prepared for whatever sort of wander you’re taking yourself on and enjoy the beauty of Fethiye!